As we advance as photographers, it is essential that we explore the various shooting modes our cameras offer. The two main modes for any photographer are Aperture Priority (AP) and Manual. Aperture Priority offers the easiest solution to your cityscape needs. Basically, we can control everything in-camera, apart from the shutter speed. The advantages of this over shooting in Auto are huge. For example, in lower light situations Auto mode will boost ISO significantly, while keeping the shutter speed low, leaving our images with masses of noise. But in AP, we can manually keep ISO low, maintain an optimum aperture, and extend our shutter speeds to compensate for the low light. All of this will equal a sharper, cleaner image. 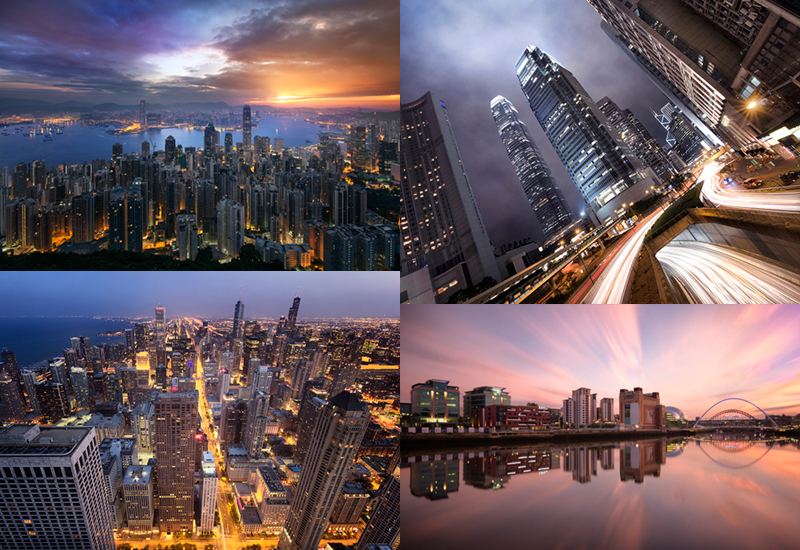 Cityscapes can have an extremely wide dynamic range of light due to artificial lighting, more so than landscapes. There’s often a large difference between the brightest and darkest areas of our images. Our cameras aren’t capable of capturing scenes of such high contrast. In order to create a balanced image, it is sometimes necessary to take multiple exposures of the same scene. Otherwise, with a single exposure, you may end up with heavily under/over exposed areas. Taking multiple exposures is known as bracketing. If you’re new to bracketing, type the name of your camera and ‘Auto-Bracketing’ in Google to check if your camera has an auto-bracketing capability (where the camera does it for you).